“Food is the ultimate connector of people, and an amazing tool to help make lives better” says Chauniqua Major, founder and Culinary Connector of Good Through Food. The new Orlando-based organization strives to impact the world through food-related efforts. Their first initiative, Project 001, launched this month to aid victims of the recent Louisiana floods. Project 001’s aim is to help the people affected by the Louisiana floods which devastated the area. Sadly, this past August, 7.1 trillion gallons of water fell on Louisiana. 13 lives were lost, and more than 140,000 homes destroyed. The devastation impacted Major, a local public relations manager, blogger and entrepreneur. “God moved me to truly utilize my heart for giving, knowledge of food and accessibility to cool brands around the world to be a blessing in our community and afar” stated Major. From October 24-31, 2016, local Orlando restaurants are joining the mission by creating Louisiana-inspired dishes, drinks or desserts. Proceeds from sales, from 25-100%, will be donated to Baton Rouge Area Foundation. 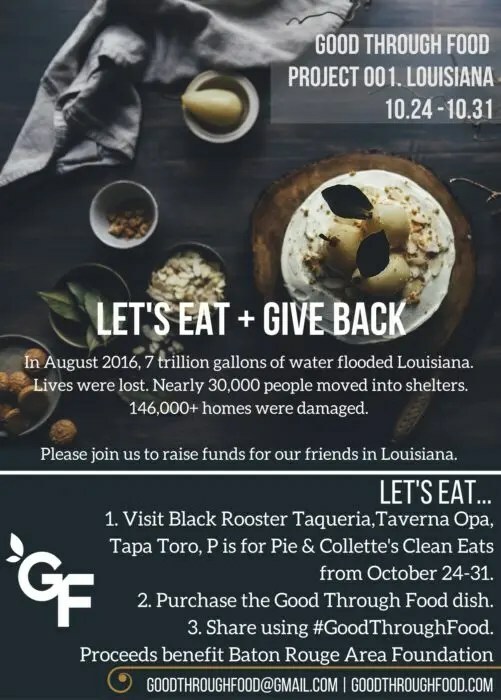 The Louisiana-based charity seeks to assist South Louisiana residents which make up the majority of the 30,000 people who were displaced from their homes. As a consumer, all you have to do is get your family and friends together and go dine at the participating restaurants listed below. Enjoy these scrumptious dishes, from beignets to gumbo, and help spread the word by sharing photos of your dishes on Instagram using hashtag #GoodThroughFood. 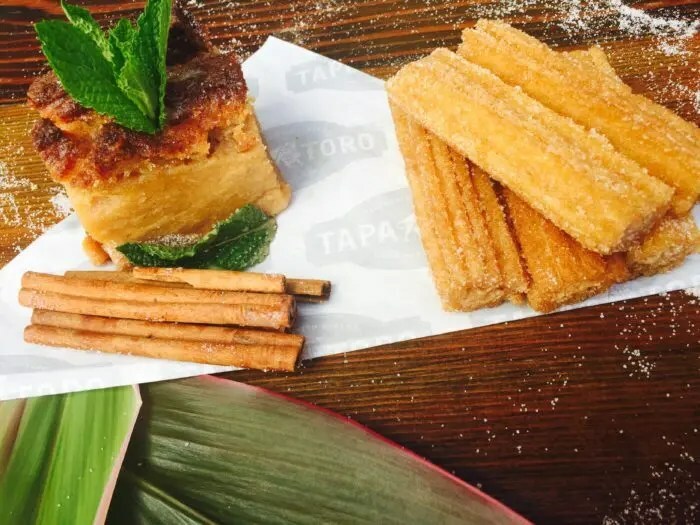 ^ Tapa Toro Tapas Bar & Paella Pit: the Spanish favorite, located in the I-Drive 360 Complex, is serving Churro Bread Pudding. ^ Taverna Opa: the high-energy Mediterranean eatery in Pointe Orlando offers their version of Greek beignets, Loukoumades. ^ P is for Pie: the haven for pie-lovers in Central Florida located in the Audubon Garden district, is offering the “P is for Pecan Caramel Hand Pie and Coffee” combo. ^ Collette’s Clean Eats: the Longwood eatery for busy foodies offers local, from scratch meals for pick up and delivery. Order their hearty Shrimp, Crab & Andouille Sausage Gumbo this week. Food always brings people together. With this initiative, Good Through Food makes these gatherings even more impactful and memorable. Where will you eat to do “Good Through Food”?